From almost every page in Project Insight you can choose your display preferences. Use the Display Options icon to select change whatever view you currently see. Don't want to read? Watch the Page Display Options video instead. You may save your Selected Columns as one of your Quick Selections. Administrators may save column display options as global Quick Selections. Note: A project task list, project Gantt chart, or folder will remember the column display options you last viewed for that project or folder. These selections do not change the display for any other projects or folders nor for any other users. is used to expand (lengthen) the vertical sizing of the lists for the Available and Selected Columns list boxes. is used to collapse (shorten) the vertical sizing of the lists for the Available and Selected Columns list boxes. This allows a user to view more column selections in the display without having to scroll. Add to the Selected Columns from the Available Columns. Remove from the Selected Columns to the Available Columns. The Selected Columns list order determines the display order on the page. Changes to the display order can be made one at a time or in multiples. It may be easier to set the column width using the drag and drop functions on the display page. Each user can build a list of column selections based on their own preferences and save it as a Quick Selection. Column headings with hyperlinks may be used for sorting the display data in ascending or descending order. Ascending or descending order is indicated by the up or down arrow. Changing the primary sort column will move the previously selected sort order for other columns into secondary sorting columns. Freeze the Header and the column titles will remain in place for your reference as you scroll down a large number of rows. The invoke the Split Table, use the selection from the drop-down to "Freeze Header and Split Table," or right-click to use the selector from within the column header. 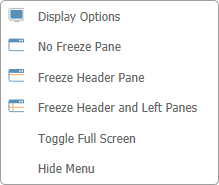 Select the "Freeze Header and Left Panes" option on the column which you would like to use as your last column on the left for the split action. Display your baseline data in parallel with current data as a row underneath the current project data in task lists, task reports and project reports. Baseline data may also display as columns by choosing your baseline columns from the available columns. Gantt chart displays have additional settings to control the range of dates displayed and the scale to chart within the chosen date range. More information for these settings may be found in Understanding Gantt Charts. Folder display options differ in that they have different available columns. There is no vertical width setting for columns on the folder views.